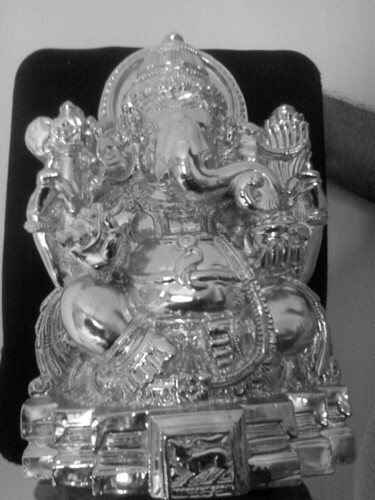 We at sinex chromes India manufacture poly marble devotional statues of various sizes of 99.8% pure silver finished devotional idols..with chrome spray technology. Sinex Chromes India came into being in the year 1992, and indigenously developed the “SPRAY ON” CHROME technology in India carved a niche as the leading manufacturer and supplier of the wide range of Chrome SprayMachines, chrome finished FRP Mannequins, multi coloured/skin tone mannequins, gold finished Devotional Statues, 99.8% pure silver coated devotional statues, silver coated mantapas, logos, mementos, chromed signage letters ,fancy gift items, house/hotels interior Cornish, bike chrome paint/multi coloured finishes, mag wheel chroming, car chroming services, and many more. We are also engaged in offering Chrome painting Services for a real mirror like finish, Chroming Services, Metalizing Services and many more. Our products and services are highly qualitative and planned and manufactured as per the need and specifications of the clients. Material of superior grade is used in manufacturing of our products, so that final range ensure desirable manner at the customer’s end. Mr. Pavan Niranjan Alexander(Proprietor) an young dynamic engineering graduate has an vision of expanding the latest technology to serve the Indian market/foreign market at an affordable price. Mr. A.J. Alexander (CEO)has helped us to mark our presence successfully in industry. It was his support and experience that has enabled us to face the ever-changing market situation with great ease. He knows how the things need to be planned so that better results are achieved. Our team with their extensive industrial knowledge and experience has helped us to carve a distinct niche in industry. These professionals with their great skills ensure that our patrons are served in an appropriate manner. They maintain regular interaction with the clients and ensure that they are served in an appropriate manner. Our team comprises quality analysts, R&D personnel, warehouse personnel and other skilled, semi-skilled and unskilled staff. State-of the-art infrastructure is developed by us, which help us to carry our production and other business related activities in disciplined manner. Segregated in varied departments, our infrastructure is looked after by the experienced staff. They ensure that the tasks performed by various units are carried out in synchronized manner.